Obituary for Martha C. (Clendaniel) Fisher | Doherty Funeral Homes, Inc.
Martha C. Fisher, age 87, passed away peacefully at her daughter's home in Claymont, DE on Friday, November 30, 2018. She was born in a farmhouse in Lincoln, DE to Lester and Viola Clendaniel and was the third of five children. After graduating from high school, she attended West Chester Teacher's College in Pennsylvania. During that time, she met her future husband, Charles A. Fisher and they married on December 8, 1951. Martha worked for several companies during her life including Sears catalog, Ludlow Webbing and Twine, eventually retiring from the Brandywine School District Payroll Department. Martha was a talented artist. Her oil paintings and watercolors adorned her home as well as her childrens' and other family members. A steadfast supporter of the Cancer Society, she donated her artwork to their fundraising events yearly. Martha was a voracious reader and avid gardener. 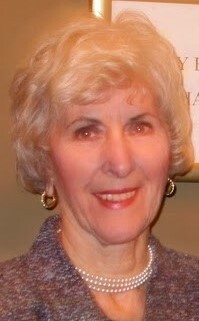 She also loved time spent with her beloved lifelong friends playing bridge, golf, going to the movies or out to dine. Martha was a devoted member of the Church of the Ascension, in Claymont, DE for over 50 years and retired from the church choir after 30 years. She had a beautiful voice and has always loved singing and playing the piano. Left to remember her love are Martha's four children, Gwen (Ronald) Runion, Deborah (Clifford) Wright, Gretchen (Rodney) Burke, and Marjorie (David) McKinley; seven grandchildren: Lucas (Lindsay) Runion, Amanda Runion, David (Jenna) McKinley, Charles McKinley, Kelly McKinley, Brooke Wright, and Paige Wright; four great-grandchildren: Logan McKinley, William McKinley, Mason McKinley, and Bennett Runion; two sisters, Wanda King and Caroline Donovan; and many beloved nieces and nephews. Martha was preceded in death by her husband, Charles A. Fisher, her parents, her brother Lester Clendaniel, and her sister, Emily Black. The family would like to extend their sincere and heartfelt gratitude to Harriet Harvey and Carolyn Wilson for the loving care they gave Martha in the last years of her life. Family and friends may visit from 9:30 to 10:30 AM on Friday, December 7 at Church of the Ascension Episcopal Church, 3717 Philadelphia Pike, Claymont, DE 19703, where a funeral service will begin at 10:30 AM. Lunch will be served in the Parish Hall immediately following the service. Interment will follow at Odd Fellows Cemetery in Milton, DE. In lieu of flowers, memorial contributions may be made in Martha's name to the Alzheimer's Association-Delaware Valley Chapter, 399 Market St., #102, Philadelphia, PA 19106 or the Claymont Public Library, 400 Lenape Way, Claymont, DE 19703.